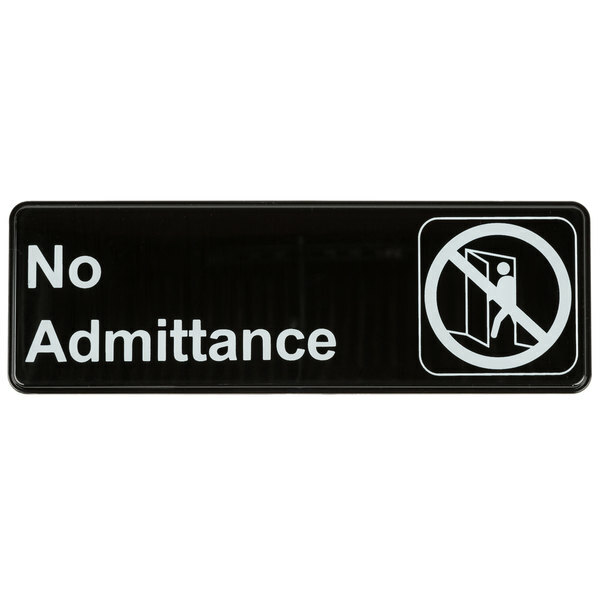 Show your customers and employees what room they are not authorized to enter with this 9" x 3" no admittance sign! 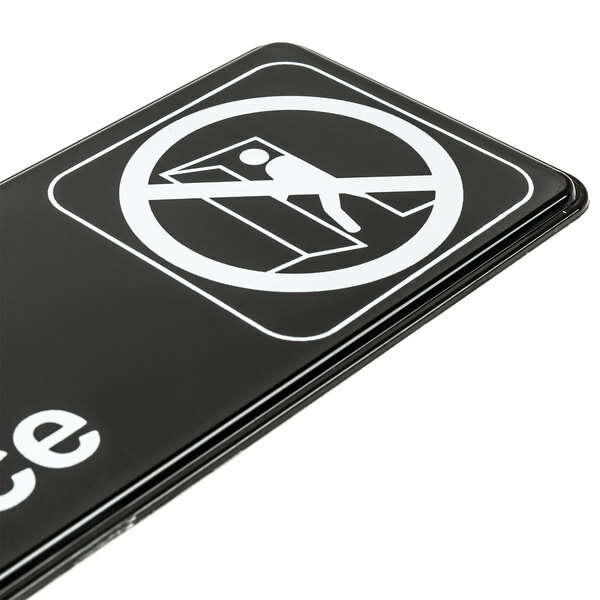 Whether it is a hazardous or completely private room, this sign will keep curious eyes away. Made of durable plastic, this sleek sign has great color contrast. The white-on-black lettering allows everyone to read it from across a room. For those who may have trouble reading, a single no-entrance symbol is posted to the side. This lightweight plastic sign is easy to clean and transport, which makes placement easy. 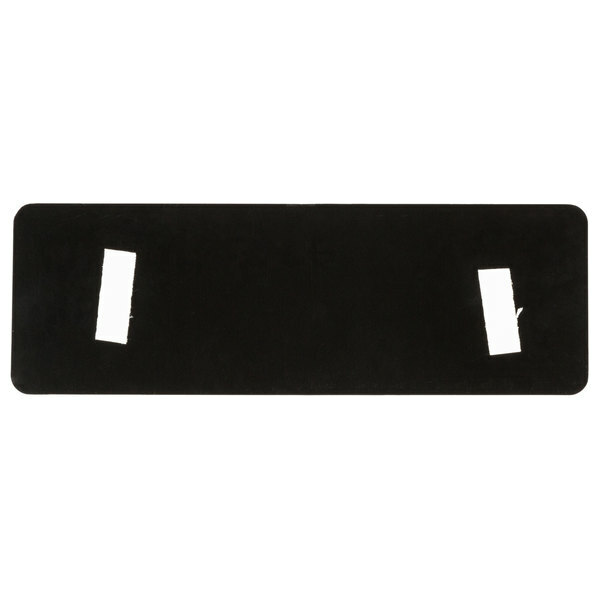 You can simply mount it on a wall or door with the included self-adhesive backing. 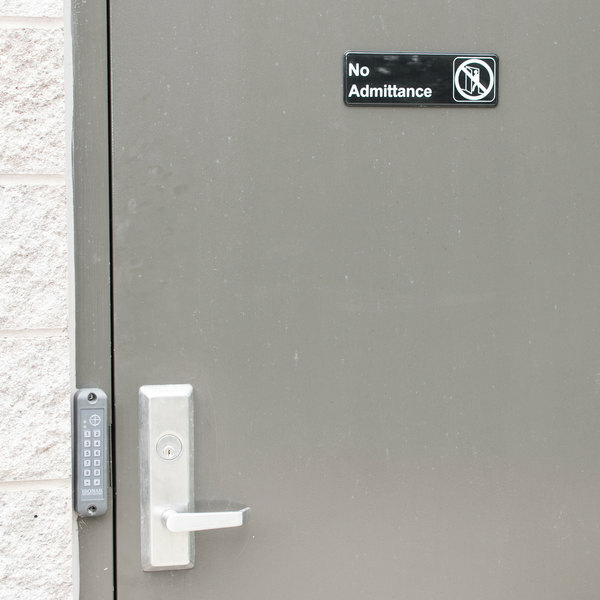 Keep your customers and employees away from restricted areas by hanging this sign and showing them which door they can't enter. In Sign - Black and White, 9" x 3"
In Case Of A Fire Do Not Use Elevator, Use Stairwell Sign - Red and White, 9" x 6"
Out Sign - Black and White, 9" x 3"
Pull Sign - Black and White, 9" x 3"
Push Sign - Black and White, 9" x 3"
No Pets, Shoes and Shirt Required Sign - Black and White, 9" x 3"
Overall User Rating: No Admittance Sign - Black and White, 9" x 3"
For areas with restrictions on access, such as a cabinet, this No Admittance Sign communicates effectively. Measuring 3x9 inches, there are self adhesive strips on the back, and this durable signage is in black and white for contrast and visibility. Loving this sign so far – its message is clear, and it's incredibly easy to mount. It comes with a self-adhesive backing and takes 10 seconds tops to install. Sign says what it needs too. Just be sure to use your own adhesive because we put ours up and a couple days later it was cracked in the ground. Do you want to mark rooms, areas, or doors that you do not want guests to enter? This sign will do the job and will save you money. 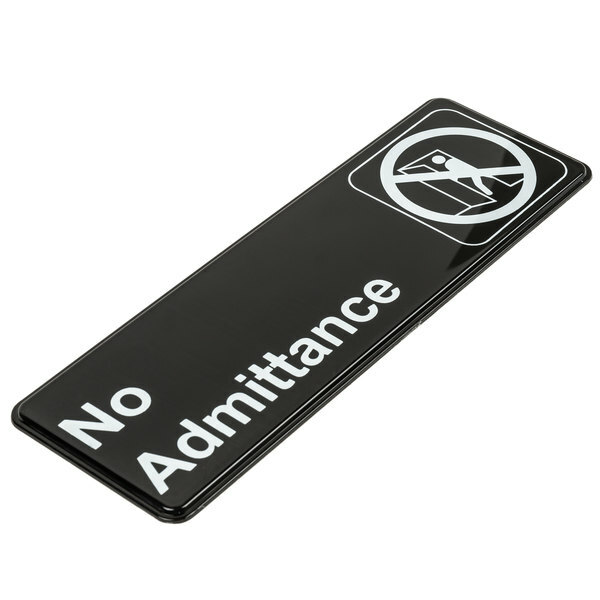 This No Admittance sign clearly indicates to your guests they are not welcome into that room or area. This sign is very inexpensive and comes with a self adhesive back for easy install. I was surprised at the quality of this sign. I expected it to be paper thin but instead is made of a sturdy, thick plastic and printed to last. Another great find! This no admittance sign is easy to read from a good distance and cleans very well. I would highly recommend, especially at such a great price. The best thing about these signs is the quality of material they are made of. They come with adhesive strips on the, so they are ready to be placed. Clearly mark a no admittance area. Zero complaints about this sign. It's really easy to put up. Works on any wall or door, though it might come off after a few months on a door. This is perfect for putting up in public places where you want to keep people out. We share a building, so often customers from the other business try to come into our workspace. Perfect sign to keep people out. This is your typical stick on sign that you would find in any business. They're nice because they aren't expensive, but we bought two different ones and the adhesive gave way on both of them within a week, which meant that they both fell straight to the ground, one of them chipping badly on a corner. I luckily had some similar sticky pads and just doubled them up to hang them again. If not for the 'not so sticky' pads, it would be 5 stars. This is a beautiful sign to use on any door that you do not want customers to use! It is a nice sign to cover up doors to boiler rooms! !